UN Secretary-General António Guterres calls for independent probe of Saudi-led coalition air strike in Yemen that killed dozens of people. 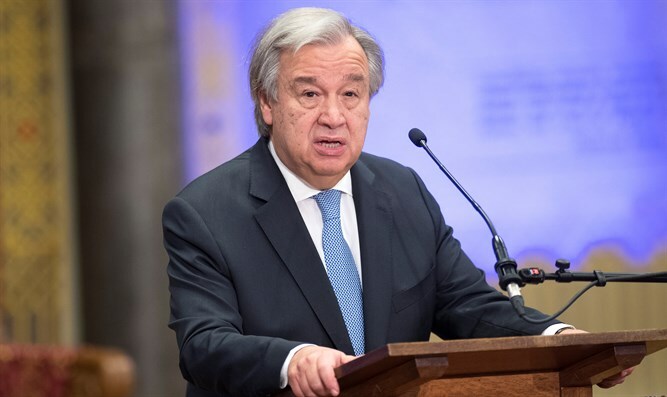 UN Secretary-General António Guterres on Thursday condemned a Saudi-led coalition air strike in Yemen that killed dozens of people, calling for "an independent and prompt investigation," a spokesman said. "The Secretary-General emphasizes that all parties must take constant care to spare civilians and civilian objects in the conduct of military operations," UN spokesman Farhan Haq said in a statement quoted by Reuters. The attack on a bus at a market in rebel-held northern Yemen killed at least 29 children, the Red Cross said, according to the AFP news agency. The coalition said it had carried out a "legitimate military action", targeting a bus in response to a deadly missile attack on Saudi Arabia on Wednesday by Houthi rebels. Coalition spokesman Turki al-Maliki told AFP that claims by aid organizations that children were inside the bus were "misleading", adding that the bus carried "Houthi combatants". The International Committee of the Red Cross said the strike hit a bus filled with children at the Dahyan market in the Houthi stronghold of Saada. State Department spokeswoman Heather Nauert said the U.S. is "calling the Saudi-led coalition to conduct a thorough and transparent investigation into the incident." "We call on the parties to take appropriate measures to protect civilians," she added. The Saudi-led Arab military coalition has been fighting the Iranian-backed Houthi rebels over the last few years. Iran denies it is backing the Houthis and has also denied Saudi Arabian accusations that Tehran provided the Houthi rebels in Yemen with ballistic capabilities. Saudi forces have previously shot down Houthi missiles aimed at its territory with Patriot surface-to-air missiles purchased from the United States.